Roux-en-Y gastric bypass (RYGB) surgery is one of the most commonly performed bariatric surgeries in the United States. Patients with prior RYGB are not amenable to conventional endoscopic retrograde cholangiopancreaticography (ERCP). Surgical gastrostomy (SG) tube placement enables transgastrostomy ERCP (TG-ERCP). Eleven patients with RYGB anatomy received open Stamm gastrostomy after which the tract was then allowed to mature for an average of 45 days before therapeutic TG-ERCP. The success rate and procedure-related complications of both gastrostomy and ERCP were assessed. 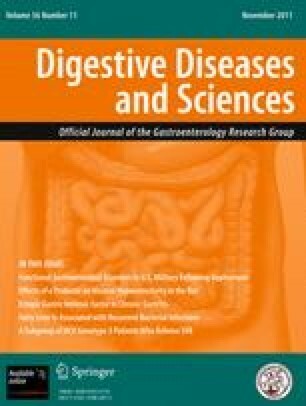 TG-ERCP was performed on eleven patients (median age 52 years, range 37–61 years) with prior RYGB and pancreatobiliary diseases. Indications for ERCP in these patients included suspected gallstone pancreatitis (n = 4), ampullary/biliary strictures (n = 5), pancreas divisum (n = 1), and common bile duct clipping as a result of RYGB surgery (n = 1). Two individuals developed post surgical complications with stomal-related infections. TG-ERCP with therapeutic intervention was successfully performed in all patients. Intervention included stone extractions (n = 11), biliary stricture dilation (n = 11), biliary sphincterotomy (n = 11), biliary (n = 3) and pancreatic (n = 1) stent placement, ampullary biopsies (n = 3), choledochoscopy (n = 1), and pseudocyst drainage (n = 1). Complications included post-ERCP pancreatitis (n = 2), post-sphincterotomy bleeding (n = 1), gastrostomy site bleed (n = 1), and gastric perforation (n = 1). The total number of ERCP sessions for the eleven patients was 15 (1 or 2 per patient). Median follow-up was 42 days (range 7–123 days). Surgical open gastrostomy followed by TG-ERCP enables therapeutic intervention but is associated with significant complications.